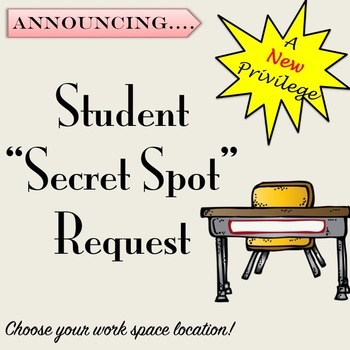 Have your students apply to sit in a secret spot around the room to complete their independent work. Students will fill out the form stating where they want to work and why they think they have earned the privilege. The teacher can approve or deny requests with a section for comments which provide the student with feedback to know how to earn the privilege if denied. ★ Follow Me for Updates! ♥ Did you know … you can earn credits to apply to future purchases by leaving feedback on your purchases? Take a few seconds to give a star rating and comment! Do you have an idea/request for how to make this product better? Shoot me an email at: gretchen@alwaysalesson.com! I'd love to listen to your feedback. By purchasing this resource, you are agreeing that the contents are the property of Always A Lesson and licensed to you only for classroom/personal use as a single user. I retain the copyright, and reserve all rights to this product. -	Reference (WITHOUT DISTRIBUTION) this product in blog posts, at seminars, professional development, workshops, or other such venues provided there is both credit given to myself as the author and the link back to my TPT store is included in your post/presentation.